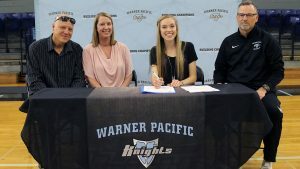 Amelia Pullen of Washougal High School made Warner Pacific University her college of choice last Friday by signing a national letter of intent with Warner Pacific University. Pullen won the Washington State 2A Girls Cross Country State Championships 5000m race in a personal best time of 18:04 last November, beating the nearest competitor by 25 seconds in the process. She has received a number of awards including being named the Girls All-Region Runner of the Year by the Columbian Newspaper in Vancouver and the WIAA Athlete of the Week in week 9 last fall. Pullen has also had great success on the track with a personal best of 11:01 in the 3200m and a third-place finish last track season at the Washington State Championships last spring. Pullen is also a very accomplished student with a GPA of 4.0 and has been taking a challenging college curriculum in the Running Start program at Clark College in Vancouver, WA. Dalzell was hired last summer to start a rebuilding process for the cross country and track programs at the university, which has recently added a number of key new academic programs including nursing and cybersecurity to their other undergraduate array of degree programs. “We are getting some good interest from some very fine student-athletes with the addition of these academic programs coupled with our renewed efforts to recruit and build a high-quality track and field program. It is very exciting to see Amelia and others discover the great opportunities that are here in Portland at Warner Pacific University,” Dalzell added.